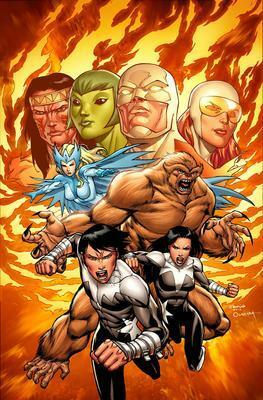 FRED VAN LENTE WROTE MORE OLD SCHOOL ALPHA FLIGHT! FRED VAN LENTE WROTE MORE OLD SCHOOL ALPHA FLIGHT! And I did not know of this. Pardon me whilst I squee. I <3 them and all their dysfunction so very much. You think we could get Van Lente working on an Alpha Flight: First Class now that he's done with Wolverine's book? The preview for Mighty Avengers #24, out next week, plus one of my favourite scenes from Incredible Herc. Because I just couldn't go to sleep tonight without posting something, here's an old post of my favourite issue of Incredible Hercules, #120, pitting our hero against the evil Skrull gods.